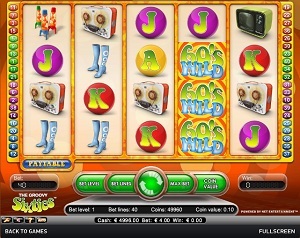 Groovy Sixties is a colorful and classic online video slot game from Net Entertainment that has been released in May 2009. This online video slot game has 5 reels and 40 pay lines. The theme of Groovy Sixties is, as its name implies, the retro, hippy and groovy 60’s era when flower power Volkswagen beetle cars, lave lamps and hip and groovy music is all the rage! At first, you will normally think that Groovy Sixties is a very simple online slot game. Thanks to Net Entertainment’s clever gaming design, this online video slot game is equipped with Stacked Wild symbols. Other than that, you get the chance to obtain splendidly high rewards with their Free Spin Bonus Feature game (there is a 2x multiplier on all of your winnings) in which you can win a maximum of €200,000! In case you are not familiar this kind of slot game, you must be careful when you push the “Max Bet” button because this means that you will be wagering 5 coins per pay line at whichever coin value you use. Net Entertainment is very generous when it comes to any of their online slots games, and letting interested players to play instantly without the need to download anything at all is one of the many reasons why they are very much well-loved by all online slots players all over the world. If you love hip and groovy 60’s music and everything that is retro, then for sure you will love playing the Groovy Sixties online video slot machine game! Get your groove on with the Groovy Sixties, the slots game that offers a maximum coin jackpot of 5,000, maximum cash jackpot of $2,500, Stacked Wild symbols, scatter wins, Free Spins, and last but not least, an excellently high 96.5% payout ratio! What most slot players find interesting and enjoyable about Net Entertainment is that they offer fun graphics and totally happy sounds, which make online slots more fun and entertaining to spend time with. Groovy Sixties is, just as its name suggests, is an online video slot game that is full of retro symbols and music that will surely remind you how the people of the 60’s danced and partied all night long! The background setting of the reels is a plain peach color and the surrounding of the reels is designed in an orange color, which is actually the most popular color during the 60’s. The symbols are drawn nicely in such a way that it depicts a classic look and it is guaranteed that playing this slot game will not hurt your eyes. The overall graphic design of Groovy Sixties displays colors such as green, blue, red, pink, purple, yellow and orange. The constant, groovy background music you will hear while you are playing the Groovy Sixties slots will surely make you mentally dance and/or sway and nod your head! The card deck symbols available in the Groovy Sixties are J, Q, K, and Ace. The regular symbols you will see in the Groovy Sixties are the Lava Lamp, the 60’s VW Bug, TV set, Reel-to-reel Tape Recorder, 60’s Go-Go Boots, and the 60’s Home Movie Camera. The Wild Symbol is the 60’s. The 60’s Wild Symbol acts as a substitute for all other symbols (except the Scatter symbol) in order to help you complete a winning combination. It is possible that you can get many 60’s wild symbols simultaneously on a reel in 1 spin, which makes Stacked Wilds. The 60’s-stacked Wild symbols boost your chances of winning by means of substituting the other symbols in order to complete winning combinations. Take note that the 60’s-stacked Wild symbols can substitute each and every symbol, except for the Scatter symbols. The Scatter Symbol is the Groovy Sixties Girl. The Groovy Sixties Girl scatter symbol is not required to come out in a line (on an enabled pay line) for you to win. These scatter symbols only come out on the 2nd, 3rd and 4th reels. If you manage to get 3 Groovy Sixties Girl Scatter symbols in one spin, you will activate the Free Spin Bonus Feature game. Take note that if you manage to get both a Scatter win and a Regular win, you are paid out for both of these wins, because the Scatter symbols are not required to appear on an enabled pay line in order for you to win. The Scatter win is included to your pay line win. Groovy Sixties gives you Free Spins in their Free Spin Bonus Feature Game – When you get 3 Groovy Sixties Girl Scatter symbols that are scattered anywhere on reels 2, 3, and 4 at a single spin, you will trigger their Free Spin Bonus Feature game wherein you will be awarded 5 Free Spins. In the Free Spins Bonus Feature game, all of your winning combinations there are doubled (multiplier x2)! If you manage to get another 3 Groovy Sixties Girl scatter symbols while playing in their Free Spin games, you are given another 5 Free Spins! The extra Free Spins are included to your remaining quantity of Free Spins. You can be rewarded an infinite quantity of additional Free Spins during the Free Spin Bonus Feature game. When the Free Spin Bonus Feature game is over, you are then taken back to the main Groovy Sixties slot game and your winnings from the Free Spin games are included to your total win. Groovy Sixties has 5 reels where you may be on as many as 40 pay lines. The minimum bet is 0.01 and the maximum bet is 0.50 per line. You can wager from 1 up to 5 coins per pay line bet. Playing online video slot machine games is much more fun and thrilling when it has an Autoplay function. You can play Groovy Sixties automatically by simply clicking on the Autoplay button that is located on the lower left side of the game screen. You can set the number of spins by clicking on any numbered button, from 10 to 1000, and after selecting the number you want, click Start and the game will automatically spin for you. If you want a slightly more complex Autoplay setup, you can click on the Advanced Settings button and Stop Autoplay: on any win, if Free Spins is won, if a single win exceeds a certain amount, or if your cash increases/decreases by a certain amount you have specified. When you are done with your preferred Advanced Settings, just click on the Start button and the game will automatically play for you.